Ferguson activist Melissa McKinnies say her son Danye Jones, who was found hanging from a tree, was lynched. St Louis police responding to a 911 call on Oct. 17 observed Jones' body laying on the ground in a wooded area surrounded by grieving family members. A family member who placed the 911 call specifically referred to Jones as a "suicide.” But Mckinnies insists Jones was lynched. The prominent Ferguson activist published a graphic Facebook post that showed 2 photos of 24-year-old Jones hanging by the neck from a tree. The photos have since been removed. "This is what I woke up to! They lynched my baby. My first time seeing these photos. If you have a weak stomach don't look but this mother wants justice after I get up. I'm sick and losing my mind but I had to let the world see what they did to my baby!" Shawn Maguire, of the St. Louis Police public information unit, told Heavy.com Jones' death is being investigated as a suicide. McKinnies rose to prominence as a vocal member of an activist group that protested the police shooting of teenager Michael Brown in Ferguson, Mo. in August 2014. RIP Young man, I feel her Pain! We keep praying for Justice yall , and even though Weeping may endure for the Evening but Joy cometh in the morning. I will say that when we try with all we have to do the right thing , try to treat Others the way we want to be treated, at the end of the day often times things can happen for Us that we wasn't expecting. Saw this on IG but couldnt bring myself to click on the link to open it up. Our young black men are being murdered left and right by each other and by other's. As a mother of two black son's, I too feel her pain. May this young man RIP and I pray that the truth be reveled and his murders be brought to justice. God see all and knows all. That's what make him so scary. Lynched?? ?...doesnt that usually involve being burned as well? What evidence is there? I'm just sayin...I need more info before I hop on the outrage bandwagon. RIP to the young man. That ain’t no d*amn suicide. Yes I know but it's a start. Prayer without action isn't good and I know that. I haven't seen any pics but I find it rather coincidentally that almost all of the people who were involved in the protests in recent years are dropping like flies almost like they're being picked off. Idk, but I saw the pics on fb. I wasn’t looking for them specifically. His pants were pulled down around his ankles. He was upright. How did he get that far off the ground without standing on something? Rope was used. Who has rope laying around. Did he buy the rope? How was the roped tied down? Did he have a history of mental health issues? A few years ago I would have thought she was hysterical but today I wouldn’t be surprised. A young black sailer was murdered after getting out of his car to help a stranded stranger. Depression is real. You encounter people every day who hide pain behind their smiles. Regardless of the cause of death, my heart goes out to her. I believe mothers with sons have a special bond that can’t be defined. Yeah, I remember his fists were balled up. Seems unusual. In the photos his arms are hanging free... so was he drugged and then hung? Most lynching victims hands are tied so that they can’t fight off being choked to death. Whatever the case, condolences to his family. 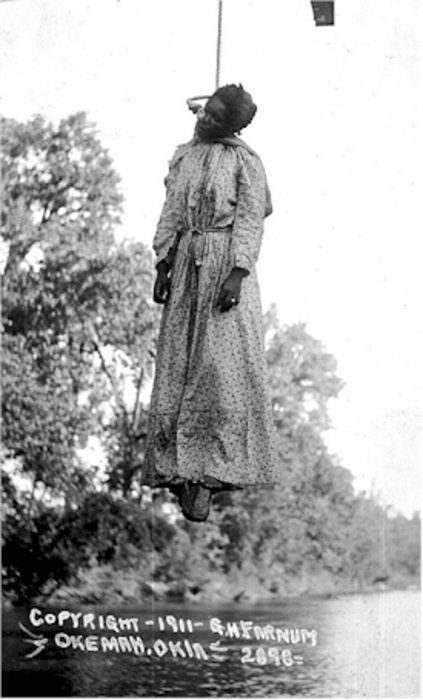 Danye Jones, who was found hanging from a tree, was lynched. Don't kid yourselves. Black men are STILL being lynched. It's just not reported on television or in newspapers. What should be news is never reported by mainstream media. Right why take a sheet outside to a tree when there's plenty of things in the house to tie it to...and why are his pants down just like in old lynching photos ??? What a mess someones killing off these activists this is the third one I've heard of over the past 4 years, I may have missed some. I don't believe he killed himself . Activists are targeted there is a history of this in America and sadly globally activists are being picked off. Where in the hell is the of Aquarius were getting clobbered. Cause young black men go outside to comitt suicide in that manner ? Mom is going to have to get forensic evidence and an autopsy expert. Who is she going to sue? Who is she going to file a criminal charge against? You need evidence, proof or eye witness. But mom is going to have to hire a detective and forensic expert. The police are going to close this case. Very true, plus I think it was a tree in there backyard from what I was reading online but I don't know how true that is. I need more details. Three possibilites. A suicide. A lynching. Or a sexual adventure gone wrong. Like the how Kill Bill died in real life. Same thing happened to my uncle. He was arrested. We got a call saying he hung him self in his cell. At the funeral he was clearly bruised and beat up. He had lumps on his forehead and bruises on his face. And they have been ruled suicides. These are not suicides, There are murders in retaliation to their Ferguson activism. It is unheard of. In fact, I believe black males have the lowest suicide rates, It's white people who have the highest suicide rates. I'm sorry to read this. My uncle died the exact same way when I was a kid. Bad part about it, his siblings and the one of the cop's families went to school together. They all knew/know each other. Face was swollen, scars and abrasions all about his face and head. But he fell. Like you, the police said my uncle slipped on soap. He was so badly beaten that in his casket, fluids and remnants of blood seeped from the wounds in his head. I'll never forget my grandmother resting his head in her hand, from the pillow, and fluids were all over her hand and the pillow. I'm so, so sorry for your family as well. That Navy murder was so sensless. When did trying to help people become a crime these days? I read last year that Trump/government were trying to get the SSN of people who were protesting at the rally's. Plus, some of the activists would post videos and comments against police brutality on Facebook ( Sandra Bland (RIP) being one of them) and that may led to them being surveiled/targeted. The CIA I heard is behind Facebook so when it comes to these suspicious deaths of these activists or anyone related to them it seems like things go hand in hand. If the revolution isn't supposed to be televised, than why are people posting on Facebook about where the next protest will be held and where to meet not thinking that their posts are being monitored. Right. Who commits suicide in that way which requires a lot if time and effort to even get himself up that high? Look around the area for footprints (other than his) if he was in any position to walk, car tracks or any other evidence they might've left. But because the police are lying......they prob assisted in a good clean up. In a few years we’ll be reading about lynchings being deemed ‘suicide’ ? stop living among your enemies!!! the devil name white man is real!!!! Waiting for the autopsy. The only troubling aspect of the lynching angle is that his hands were not tied behind his back if he were actually lynched by someone. His are handing free, and there is no reported signs that there was a struggle. It is also rare and risky to hang anyone in their own backyard. Only an in-depth investigation will reveal the truth. Hopefully she can get someone to give her the proof she needs so she can get Justice for her son.. I am so very sorry you lost your uncle in such a manner. ??. Peace and healing to you and your loved ones. ?? I cannot imagine! How awful Lorenzo!! I can’t imagine!! I am so very sorry!! ? You watch way to many movies! Wtf are you talking about. It is all the way possible to have been lynched and none of those things take place. Perhaps he was unconcious during? Perhaps he was drugged right before etc.. there are other ways this could have happend. I couldn’t believe it!! I am heartbroken about that story!! Why??? This one too! Smh. These are terrible times…almost all over again. ? I was so very distraught reading the young sailor’s story. Just so unnecessary ?? People been getting suicided for sometime now. "If the revolution isn't supposed to be televised, than why are people posting on Facebook about where the next protest will be held and where to meet not thinking that their posts are being monitored." "The revolution will not be televised" was coined before these stupid technollenials were even thought of. They talk to much. Voluntary Government informants. And the telltale, pulled down pants--A clear not-so-latent-white-homosexual indicator that was often a part of the lynching ritual. Why would this man pull down his pants knowing that his mother or someone in his family would probably find him? Right. If black males don't care about other black males, who will? Regardless of 'wouldn't be nothing without a woman or a girl' it's still and forever will remain a man's world. Get the house and Vote!!!! This world is run by demons, I can't believe am saying this I use to laugh at people if they said anything similar but now am convinced. The cops are lying they serve the elites first and foremost. Trust it's extremely possible to be lynched without having your hands tied. Hundreds if not thousands of black men and women have been lynched with hands hanging freely, and no visible signs of a struggle. you don't think they're going to deliberately leave evidence, do you? 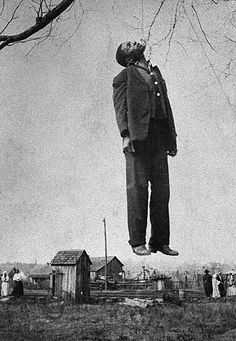 i don't believe black men just hanging themselves from trees. yall can believe that shyt if you want to. a few years? sheeeeedd now! and count the prison ones too. awwww man. it's those days all over again but people refuse to see what is right in front of their face! lynching can be any type of death (hang us, burn us, shoot us, cut us, beat us, or simply disappear us). ENOUGH OF ALL THIS!! All of us will have this! If we dont start showing up! VOTE VOTE VOTE. STOP KILLING EACH OTHER. They building jails for US. they shooting US. they hate US. But we hate US more. Get ya kids in check. We have to matter to one another FIRST. WHAT HAPPENED TO US. I dont understand. Man this is only the beginning. We showed up in NUMBERS and WAVES to get OBAMA in. NOW we missing. OUR KIDS are NOT being PRODUCTIVE. and PARENTS YOU KNOW IF YOUR KIDS ARE ON THE RIGHT TRACK OR THE WRONG. We have to hold us and our families accountable. I suggest you look at the photos again. You see there was a struggle based on the injuries to his face and no, it’s not just from hanging. That young man was murdered and was strung up as a calling card. He was lynched. And not the first time it has happened either. Happened here and was swept under the rug. 4-5 years ago. RIP to Danye and to Lennon. "N.C. teen's hanging death ruled a suicide; mother says it was a lynching"
Only an in-depth investigation will reveal the truth. No. It wont. An in-depth investigation will not reveal not sh&%. Lennon wasnt even wearing his own shoes and they were sizes too small. To this day they dont know whose shoes they were. After an "in-depth investigation". Wake up and try to stay there. Get us the hayle outta this post. His face appears to be swollen, and why would he pull his pants down? Did he intend to humiliate himself in passing? You making too much sense they won't like your post. As my father is fond of saying, while we're sleeping "the man" is up plotting and planning. You wake up to all of these new implemented policies and procedures ( i.e. Stand Your Ground). thinking, wtf! just happened here. Crap done straight pist me off this morning. Like truly. A sexual adventure gone wrong ? Out in his mama's backyard? "Let’s face it, Black folk are killing themselves and the rate of suicides are only increasing across many demographics. Among those numbers, hanging deaths among Black boys have nearly tripled, while suicide among white youth has seen declines in those same categories. The link to poor mental health practices in the Black community has a direct correlation to suicide, especially in the case of Black men who traditionally don’t seek mental health services. Depression, a fast-growing symptom in the Black community, is one of the leading drivers of increase in suicide." Sandra Bland did not kill herself! Can you prove that black men are still being lynched. I swear people on this blog just type shish as fact when it's a bold faced lie. This man could have very well committed suicide or killed by another black person. The later would be no surprise. The Department of Veterans Affairs reported an average of 20 veterans died by suicide every day – an often-cited statistic that raised alarm nationwide about the rate of veteran suicide. The rate also includes active-duty service members and members of the National Guard and Reserve, not just veterans. So why did a family member who called it in say it was a suicide? Sorry to burst your bubble, tuuts. Black men DO commit suicide. Not saying THIS one up top was a suicide. My brother did. My best friend had TWO brothers that did it. One as recently as two years ago, on Christmas day, in a graveyard. It happens. I saw the pics. THIS is a very sensitive subject matter. I'm off this post. So sorry to hear this. Almighty bless your grandmother and family. And why would he be on the ground before the policemen get there, with the family surrounding him??? So those pictures were taken before the police got there?!? So they tampered with “possible evidence”?! Can you prove that he was not? I swear yall think that just because there are no plantation slaves anymore, that the KKK, racist bigots and slave masters went away too. No ma'am, THEY had children, that had children, that had children. What fantasy world are YOU living in? Nevermind, I don't care to know. Wow. Just read the article, so many inconsistencies and things that don't make sense. I hope his mother gets some justice. What does hell does voting have to do with this? It's time for Blacks like you to stop repeating the scare tactics of your liberal masters.All the paranoia in your post is exhausting! I never got over the fact he left home in one pair of shoes sized 12, HIS SHOES... and was found with shoes his mom and his family had never seen before in their lives, were beat up, and were sized 10.5. And then THOSE shoes got missing during the transport of his body. HIS shoes were never found. That told me all I needed to know about that case. There are still plantation slaves and if you've read my posts on this blog I always mention about black folks scared to leave the plantation. You've given me no proof that this man was lynched. Black people do commit suicide you know. And according to statistics those suicide rates are rising. "More elementary-aged African-American children have been taking their own lives, and black boys and girls between the ages of 5 and 12 are doing so at roughly twice the rate of white kids the same age." "Suicide rates in the United States have traditionally been higher among white than black individuals across all age groups," a study published this month in the journal JAMA Pediatrics states. However, "analyses revealed that the suicide rate among those younger than 13 years is approximately 2 times higher for black children compared with white children, a finding observed in boys and girls." Those were my exact thoughts as well once I saw the pics. I was a bit confused by his hands being free. Not saying he wasn't lynched at all but there are already so many holes in this story. I could only imagine that if someone was trying to lynch me and my hands were free, they would be catching these hands til the very end and it would show on my body that there was a struggle and I did not go out without a fight. I pray the family gets closure and like you said, the truth be revealed. At the end of the day, another life has been lost. I stand corrected. This is so sad. My eyes have been opened. I never thought about him being drugged or even knocked out before he was lynched. WOW, WOW, WOW!!!! This is crazy. May the truth be revealed some way some how. LITERAL plantation. And you typed all of that and still didn't provide proof otherwise. Can you prove that they are NOT???? Well that's easy to answer... someone came out and was like get him down. If I saw my children hanging on a tree... I would want to get them down. I doubt he would pull his pants down to commit suicide. That's done for humiliation. Not buying that story!! They killed him! Black ppl keep waiting for a tipping point. We are already HERE. Certain states have subtle racism & others very OVERT! Places like Missouri is overt. Outright lynching. Stop waiting for this to hit ya doorstep and get ACTIVE NOW! You cannot VOTE your way out of a lynching. You WILL NOT VOTE YOUR WAY OUT OF RACISM!! Radical politics is what is needed and NOBODY who is running is about THAT life. Even Lumumba out there in Jackson Miss is doing ish that has his FATHER rolling over in his grave. WE NEED REVOLUTION! I gave you information that suicide is on the rise in the black community. If you believe that black men are being lynched the burden of proof is on you. Black people who follow white liberals and demoncrats are on a literal plantation but it's a mental one. The burden of proof is on you. You emphatically stated that black men are STILL being lynched. Prove it or STFU. I don't have to prove anything to you! LMBAOFFFFFFFFFFFFF!!!!! Since you are so hellbent on saying that lynching is not the case the bring your receipts instead of your lousy attitude. I never wrote that lynching is not the case. I did write that he could have committed suicide or been killed by another black person. Suicide is on the rise in the black population too. The man was left hanging literally. You wrote that "black men are STILL being lynched." Prove it or just STFU with your "automatically the white man did it attitude." Child sit down somewhere. All I am going to say is black folks are sitting ducks. If you are in a state where you can carry legally, get one. Keep praying while they keep killing. Be gone troll. I wasn’t talking to you. Roll up on me and I have some thing for you. White people like you seems to have this complex where you deflect all the traits you hate about yourself onto others. No one cares about you, you don’t even care about yourself that’s why it’s so easy for you to hate others. Have you seen the pics of this young man's body hanging upright? We're not discussing black on black crime here but since you brought the subject up, yes blacks die from a higher incidence of black on black crime violence. But just how many black people do you know or have read about in the news who went about hanging other black people to death? I'm just saying it's possible for foul play to have been met in this case. This is going over YOUR head. I said what I said. Read it for what it is. I know about MENTAL slavery. YOU live it everyday. I didn't ask for info about it being on the rise in the black community. I asked you to PROVE that he WASN'T lynched. You can't. No need to reply back. Your comment would be considered rambling rubbish at this point. Move around. I am not, will not see the pics. I have a 20 y/o son and I cannot take it. This story sadly had/has me shook Yoni! ??? I glanced at them when they popped up in my IG feed. I haven't been on social media since. Disturbing. Racists are getting too comfortable these days. They use to hide now they are shooting us in broad daylight and harassing us brazenly. But yet democrats, who win the black vote @ 85% want to do away with the 2nd amendment’s “right to bear arms.” So how’s that gonna work? I don’t know but better get your guns now before the Jews change the laws. It was all good while the blacks were being murdered but now that they have been targeted the gun laws will change. Statistically speaking, most races kill more within their own community. People kill where they live. In 2017, both white on white murder and black on black murder both fell within the 80%-90% range. Meaning for all murders recorded by the fbi, the majority of them where committed by people of the same race. You are obviously just repeating the same nonsense you have read on social media. While it true that blacks only make up 13% of the population. What you are not accounting for are unsolved crimes and crimes where race is not know. Racial bias, criminal profiling, wrongful convictions, social background and economic background (property) all play a role in crime. You also must look at age and gender. The U.N, as well as other studies, have found that black are not only targeted more, but are also more likely to be wrongfully convicted. You are also over looking other violent crimes that aren’t being committed by the blacks on larger scale. So yeah... I would go get a college degree if I was your level of ignorant. We'll always be victims as long as we keep waiting on a unjust system to give us justice. On the contrary, I have been to Atlanta. I have walked the streets. I also have family in Chicago, I have friend who is actually from Africa finishing up here med degree there and another friend who’s an black Programming developer, who visits there often. Both places have great food, great entertainment and a lot of history. I suggest you leave you surrounding, go take a few classes and actually become enlightened. Glad we could agree on something, good day. And I'll be willing to bet that letter saying you weren't registered is another ploy that came from the democraps to make you go vote because a republican wouldn't tell ya. Exactly....we are our own self worst enemy. Shameful that most in the black community can't accept that Trump has done more for us in two years than any other president ever. Yet we allow our emotions to prevent us from speaking with him about reforming the prison / justice system that affects us more than any other race. I just can't with this thinking...not today. Or by his people who took the picture for dramatic effect? My people perish for a lack of knowledge because they reject knowledge...Hosea 4:6 - Trump has done more for black people (with his clown azz) than any other president or black leader.